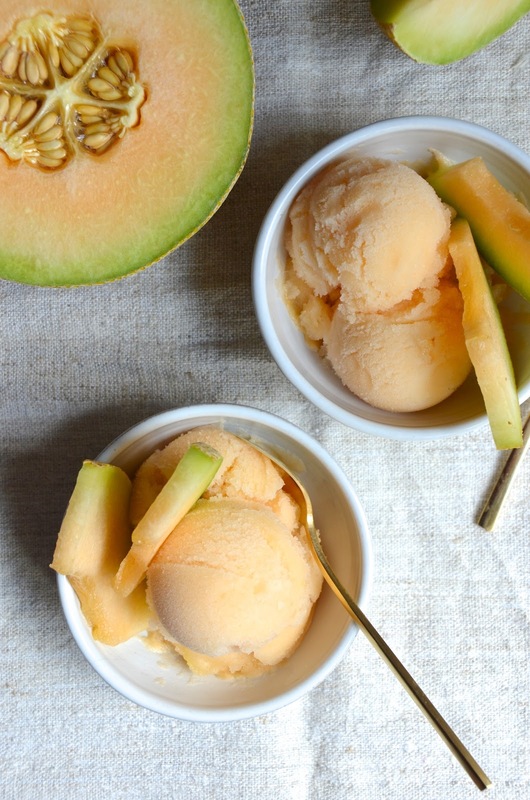 This Simple Cantaloupe Sorbet recipe is about as easy as it gets. Just pop a few things in a blender, puree, freeze in your ice cream maker and boom! Sweet and refreshing sorbet that tastes just as good (or maybe even slightly better!) than the fruit itself. The secret here is to start out with the sweetest, ripest cantaloupe that you can find. You want the kind of cantaloupe that is so fragrant it makes your entire kitchen smell musky and melon-y. (I KNOW you totally know the smell I'm describing.) It should feel heavy for its size, too, with a nice even color and no mushy bits. 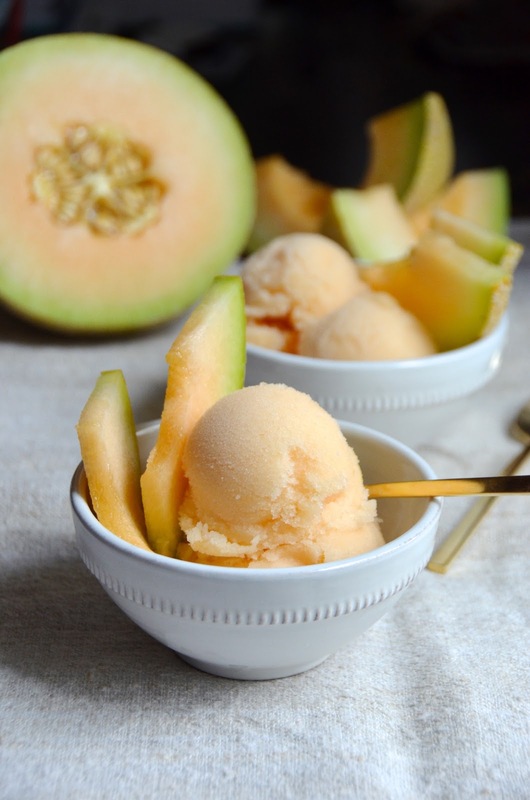 Cantaloupe is already pretty high in natural sugars and that combined with the soft pulpy flesh makes for a naturally creamy sorbet without having to add much to it. Just a bit of sugar and some fresh lemon or lime juice (you pick! ), a tiny bit of salt to balance everything out, and you're good to go. You don't even have to make a simple syrup for this recipe! I just toss the granulated sugar right in with the melon and let the whole thing puree until the sugar dissolves. This both saves a step AND keeps the sorbet as thick and creamy as possible. Note that you DO need an ice cream maker for this recipe, but it doesn't have to be anything fancy. I've been using this same inexpensive ice cream maker for nearly a decade and it never fails. This sorbet will keep really well in the freezer for a few weeks as long as you store it properly. Unlike with a lot of homemade ice cream or sorbet recipes, I find that this one stays pretty scoopable even after a couple weeks. Cut the cantaloupe, remove peel and seeds, and chop into 2" pieces. In a large blender, add the cantaloupe pieces, lemon or lime juice, sugar, and salt. Puree 3-5 minutes, or until completely smooth. Pour puree into your ice cream maker and freeze according to manufacturer directions. Remove from ice cream maker and transfer to an air-tight container (it will probably be a melty "soft-serve" style at this point). Place in freezer for at least 4 hours to freeze completely.